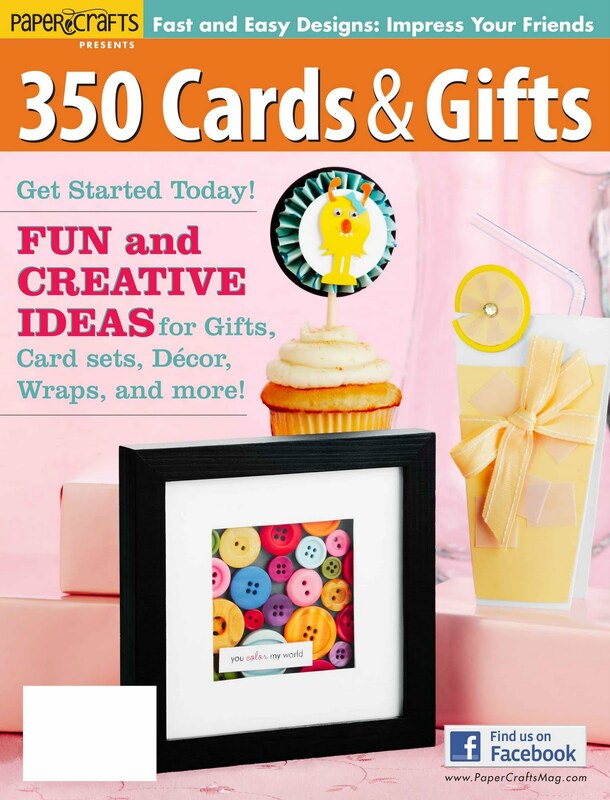 Welcome to the 350 Cards and Gifts Blog Hop, celebrating the publication of Paper Crafts newest magazine. For this blog hop, we were asked to create a project using one of the fabulous patterns from the magazine. 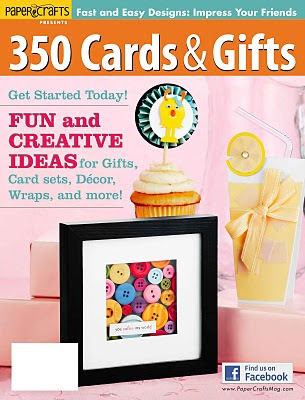 All the templates and patterns can be found HERE at the Paper Crafts Website. I have created a project using Alicia Thelin's Housewarming Home Container Pattern. You can find her fab project on page 100 of the magazine. I loved making this - I stamped the windows and doors from a house from Hero Arts Mi Casa set onto 7Gypsies patterned paper, then stuck them to the kraft house which I'd stamped lightly with Graph Background. Simple and fun. :) Thanks for the inspiration Alicia. Then, leave a comment at the Paper Crafts Connection blog to be in with the chance of winning a fun giveaway! This is gorgeous! Love the subtle graph stamping. WOW! I love little houses and yours is wonderful. My word... this is cool!!!! Thanks for sharing!!! The paper you made the windows out of really pop the house to life. Thanks for sharing. The house is amazing. Love the text print used for the doors and windows! What a gorgeous little project! Thanks for sharing! I love this, how cool and it truly does look so fun to create, well done! Wow! Fabulous project, Lucy! Congrats on all the pubs! Wow Lucy! What an awesome idea to make this box into a house! Superb and fabulous use of those papers! What an amazing idea with this, and it looks sooo cool too. Really great work hun. Lovely housewarming box, congrats on having so many projects published! Such a beautiful project. Your work is stunning. Thanks for the inspiration. love the housewarming box, such a great idea! What a great new neighbor gift! Love your work. I should have one these in my present bin, what a perfect little gift holder. I LOVE it! What a fun project, and so "Lucy"!! So pleased to see you soaring in your endeavors! Hugs! Love your adorable gift basket and the papers and stamping are perfect for this project. EEEKKK! Oh how I love this! It's so adorable - a perfect gift for a new neighbor. It is an honor to be a part of this blog hop with you - you are incredibly talented and inspiring! my mom collects little houses , perfect for her mother day gift. Great packaging idea. Not too complex, not too plain. Love it! You are amazing Lucy!!! Love it. What a beautiful project! Thanks for sharing it with us. I love little houses and yours is very beautiful! Great job! I love little houses (I have 2 dollhouses)and yours is adorable! I'm so happy for you! You're getting the recognition you deserve! Love this amazing project, Lucy! This is adorable! Two of my sons are buying homes in the near future, and I will use this pattern to give them each a housewarming gift! Thank you for the inspiration! I love it! I absolutely love this house box! AND congrats on all 6 pubs in one magazine! That is HUGE! What a sweet welcome this is. A darling project Lucy! congratulations! Love this house! The papers you used are just perfect! Oh Lucy you can do no wrong! I love everything about this. Oh my word...that is fabulous! I love this project, so sweet and so beautifully simple. Great job! Wow! That house is too radical. I'm so impressed. AWESOME!!! i love your blog and took away a few new technique ideas as well as design ideas!! :) thanks! Cute house! Great idea for "welcome" baskets at church! This is hands down one of the best houses I have seen in a while, I love the way you did the windows and doors and the overall muted colours are just superb and looks so classy! Beautiful idea Lucy and such a wonderful gift! i love your HOUSE, awesome! That's a great house and love the pattern windows and doors effect. Oh, I lOVE your house! It is so darn cute! This little house is so great! Thanks for showing the products you used too! I love being able to see exactly how it was made!! This is fabulous! I love the text print paper! Love the simple, clean and yet detailed design. Wow, Lucy this is so awesome! Love it! Gorgeous project,Lucy! love love it! I don't know about you - but I'm ready to move into that adorable house! Those little text windows are a beautiful touch. Love the details...thank you for sharing your wonderful talent. I look forward to following your blog! What a fantastic housewarming gift box. I just love what you did with it. This is so cool, I love it, great papers! Oh my love love love it.... Gonna have to keep it mind..
Oh my good gravy but this is fabulous! I am definitely going to be using this idea. I can just see a christmas house filled with holiday cookies for my family and friends. THANKS for the inspiration! How cute is your container! I love the patterned paper you stamped on. It really adds to the overall feel. What a great project, love how you used the printed text paper. Makes me wish I had that stamp set! Oh my! Wow! That is one fantastic "House" warming gift. Such a fabulous gift, Lucy! That is so cool. And I have to say that I appreciate the way you post your "ingredients" to the making of each of your projects. Adorable! I have to make some of those now! Maybe little Easter containers! I love the rustic look of this house! Fabulous!!! I love the subtle graph lines, the inking...just a completely fabulous project! What a cute idea. Now if only I knew someone moving to give that to. this is wonderful!! I love the clean look and style of this house! Aww. This is so nice. I might even have to try some of this fussy stuff. I really like this little house. It would be so great for a housewarming gift, or bridal shower. Way cute but sure looks like a lot of work and time consuming. Great job! Hope I win the magazine! I love little houses. Your project is just wonderful. I have to try it. Thanks for the inspiration. Well, I shouldn't be surprised that I can't decide whether to fall out of my chair or drool in the keyboard. It's you (and you've been one of my heroes for ages) but this THIS is off the hook. You always take it to the next level. Off to find that template and that stamp... Thanks for the amazing inspiration, again. Wow! Very lovely!!! Thanks for sharing!! What a cute house! I have some friends who just bought a house and that would be a perfect little way to send them congratulations. Thank you for sharing this. Love this! So fantastic! I must get this magazine! Congratulations on all the publications!!! Love this little project. This one takes the cake-LOVE it! The dictionary paper is fab! Adorable house. Love the windows and door. What a great idea, thanks for the inspiration. Oh my gosh, this is the cutest! I love the texty windows and doors. This is so cool. And the colors and stitching are awesome! Soooo cute!!! What a great gift! a cute idea and something that will continue to be useful. This is so sweet! I love how you did the little windows. Great ideas! What a cute project Lucy. Thank you for sharing all your creativity. Great project, Lucy! Looks really awesome! Congratulations on your accomplishment. As always, love your work. What a great project - I love the simplicity of it!! Great home decor! This is awesome. Such a great gift. Cutest idea ever. You are so creative!! Thanks for sharing. I really like your choice of patterned paper. The writing really makes this project stand out! Thank you. Oh, how cool! Can't wait to see what else you've done in the issue! This is sooooo cute!!! Who wouldn't love to get this!?! This is absolutely GORGEOUS!!!!! Thanks for a chance to win! I'll be trying my hand a that lovely little house! This house pattern is the cutest! Love how you stamped the images onto your project, and what cute gem doorknobs! TFS! what a lovely idea for a house gift! This is an adorable gift for someone who has moved to a new home. Very cute! sigh ... it's SO STINKIN' CUTE ... and knocks my socks off (there they are, beside my chair!)! Thanx for the inspiration and blog candy opp! When I grow up I'd like to stamp like you! Love this idea! I am taking an online course and I plan to use some of these ideas. What an adorable package! I hope I can make something like that. Oh my gracious, this is so stunning! I love text paper, I love graph paper - so that graph background is just more to make me squeal. What a beautiful piece of work!! Wow Lucy - this is so fun! I am definitely going to have to get this issue ASAP! Congrats on having so many things published in this fabulous issue - you deserve it! Very neat! There sure are a lot of gift ideas coming out!! I love houses and especially this one. Must download the template and start immediately! Thanks for sharing. What a fabulous card- it would make me want to move house just to receive it !! Congrats Lucy on getting so many things published, though I'm not really surprised as your cards etc are terrific- I love seeing what you create. What a fun project! This looks so cute! Thanks for the chance to win ... and have a great weekend! That is so cute! I'm deciding my presents have been delivered way too plainly in the past! I love this so much I'd want to have it sitting in my house to look at all the time. Couldn't bear to give it away. Would have to make many I think! Super cute. I especially like the text background on the windows and doors. I love this house. You are very talented. Thank you for sharing wiht me. What a cute project. Congratulations on having so many projects chosen! Fabulous project! I love it! Looks like a terrific magazine too! Must be loaded with inspiration! That's terrific! Particularly the bookpage roof and windows. Love that house...thanks for sharing!!! So creative - love newsprint and love the subtle graph! Awesome! I love your choice of stamps. TFS. I am just loving all this beautiful inspiration. Thanks SO MUCH for the inspiration. Wow, this is an amazing project!! I especially like the stitching!! This turned out DARLING!!! So cute. Just darling...love the Kraft color scheme. GREAT projects! I love your pieced print papers! This is a creative take on that pattern with the windows and graph background. Nice project! super fun project..the awesome house pattern certainly fit for a housewarming occasion celebration! How cute. I love love love this blog! Love how it looks like you stamped on newspaper. this is just brillent and I love the kraft colors you used. So rustic and yet home-y. So cute! Your home looks so warm and inviting! This is so clever and beautifully created. Who would have thought a box could be so fantastic? Very cool pattern! Love the grid background. What a fun gift container! Love the house. Great project. Thanks for sharing. I may just have to make my neighbors a nice treat! This project is absolutely stunning. This would be so nice to use for a house warming gift/card. Thanks for sharing. Just love your house gift bag, Lucy! Amazing details! And big congrats on everything published in Paper Crafts!! This house is too fabulous! I am awed by the texture and dimension. Mahalo for the inspiration! Love the newsprint paper for the windows and doors.. Great inking, and stitching, just a top notch classy project!!!! Very clever use of background paper and a great gift to welcome new neighbors. I like the stitching around the "walls" of the house especially well - it highlights the design, I think. What a great project! I love your windows and doors! 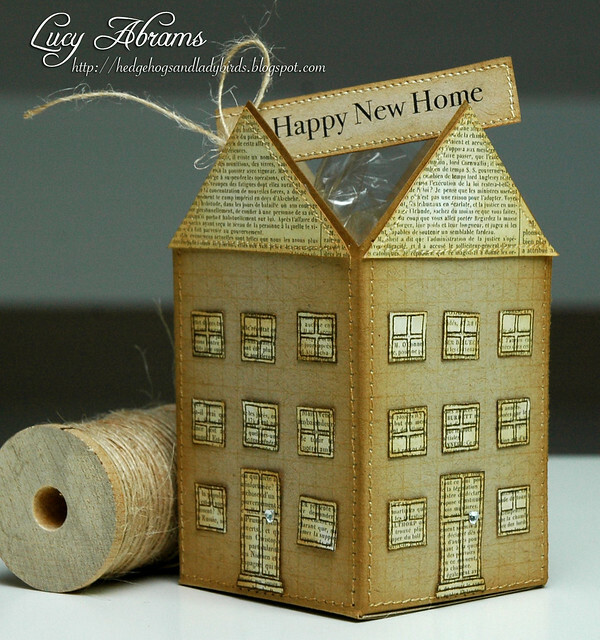 This little house warming box is perfect for new neighbors! What a great little design!! Thanks for sharing!! That is way too cute! What a fun treat box, looks yummy! Wow! What a beautiful project! Love the text paper and the stitching. Oh Wow! this is such a creative fun gift holder! What a cute project! Thanks for the chance to win. Your project is fabulous! Your work is always so inspiring - thanks!